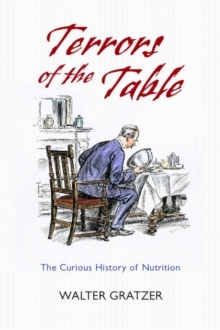 Terrors of the Table is an absorbing account of the struggle to find the necessary ingredients of a healthy diet, and the fads and quackery that have always waylaid the unwary and the foolish when it comes to the matter of food and health. Walter Gratzer tells the tale of nutrition's heroes, heroines and charlatans with characteristic crispness and verve. We find an array of colourful personalities, from the distinguished but quarrelsome Liebig, to theenterprising Lydia Pinkham. But we also find the slow recognition that the lack of vital ingredients can cause terrible illnesses - scurvy, rickets, beriberi. These diseases stalked the poor in the West even into the 20th century, and scandalously remain in poorer parts of the world today. The narrative stretchesfrom classical times to the modern day and gives a valuable historical perspective to our current understanding. It also highlights some of the problems faced by the developed world regarding health today - in particular diabetes and obesity. And despite our far greater understanding of what our body needs, there are still many who would fall for fads and fancy diets - some dangerous, others just daft. Of course, the story of nutrition does not end there. We have discovered the key vitamins and minerals our body needs, but research continues on the connections between diet, health and disease. The body's biochemistry is complex, and there are no easy answers, no magic formula, that applies to all individuals. The safest and most rational course would seem to be a sensible, moderate, and varied diet, not forgetting that 'a little of what you fancy does you good'.